Yesterday evening I went to an evening retreat to kick off the Year of Faith with Regnum Christi. I was invited by someone who saw me going to mass everyday and happened to walk out of mass at the same time as me. There was a speaker, Lucy Honner, who I found very interesting as she spoke about faith and what the Holy Father says about it. I even got some notes from it! She took the word ‘faith’ and broke it to five different sections on what faith must be. I will share with you what I came back with. The notes were chicken scratch…perhaps they will make sense to you! Faith the rock of my life. Don’t just know and believe in Jesus, believe in His message. Actions of faith must be done with more intent. Faith must become firmer and stronger. Faith is not passive and for ourselves only. Gift from God, share and proclaim. Faith evolves and grows, we must maintain it. Must leave an impression to others of my witness of faith. Need exact knowledge of the faith. Don’t be satisfied with limited information. Pay attention to the content of our faith. Remain up to date with realities of faith. It is hard work, it costs, but opens outr minds. Faith is a gift to us, but we will be tested. Can’t just make faith happen with good intent and good deeds. Letting go, open to grace. Must be a hero of the faith. Be unafraid to stand up and stand out. Risk and sacrifice own life knowing God’s presence and that He has a plan. Faith is assurance of things hoped for. Often times can be uncomfortable. Be heroic in the way we pray. Be heroic in ordinary ways. Be heroic in relationships with others. Be heroic in the way we are called to serve. I hope you can find something that strikes your being in these notes. I know they are not the best, but it is more than I usually get. For reading on the Year of Faith, check out the Pope’s Apostolic Letter on the Year of Faith. It will be good reading I am sure! So, is your faith as strong and informed as it could be? What will you do in this year of faith to strengthen yourself in our Lord? This post is one that has taken time and thought to explain what can never be explained fully. Those who will understand the full capacity may be few, but could be more than I think. There are some who have experienced this with me, and a couple who know me so well they can understand anything from me. They may or may not have taken me forever to compose. Either way, I hope this profoundly influences you or at least brings you to think a little harder about your faith. (please note: pictures were found online, none of them are ones from what I am about to tell you). This is a tad longer than my usual posting, but this one is extraordinary. Since I have gotten here with the Salesians, something has most definitely felt right for this time being. At the same time, though, there have been things trying to throw me off course and lead me astray. On the eighth I was drawn to wanting to start the novena to Saint Therese. Since my Pieta mentioned praying it the ninth to the seventeenth, I decided I would start that next day. The novena was being said for clarity of my vocation and reassurance that this is indeed where I am supposed to be, at least for now anyways. In case you did not know, Saint Therese promised to send a shower of roses upon the earth. In saying the novena, she responds with a rose or some roses that come across your path. Day one of the novena. When I walked into the laundry room, there on the table with the clean clothes and some sewing machines was a bucket. It was not just any ordinary round mop bucket with handle, but rather one that had a single huge rose sitting in it. I stopped dead in my tracks. Really, how could it be that a rose could already appear on the first day of this novena?! I was most definitely beyond myself at this point. When I started the novena, I had made the point to myself for this to be a private thing, but I could not help but share this with some of the other aspirants. Day two of the novena. I was not sure what to think after day one. Part of me expected that what I had seen the day before was all that Saint Therese was going give me. Then there was something I was not sure I could count. We were watching the movie Adam. In there, he had some roses he was bringing to give someone. He stuck them in his coat to keep them safe (he never did, in the end, give the roses to her). I was drawn to them, of course. Day three of the novena. We went to Stony Point to the Marian Shrine. There was much to wander around and see while there. To end our visit there, we went into the chapel that is there to pray our visit before heading back home. In front of the altar was a beautiful, full, colorful bouquet of roses. It surely made me smile. Day four of the novena. So you know when you walk down one hallway and someone walks down the other hallway crossing your hallway, there is a limited amount of time that you actually could possibly pass each other. So Sr. Colleen was walking with her mom one way from her office to her room and I was on the way to my room. She happened to bring a huge bouquet of roses with her that her mom had brought here. They ended up at the front dinner table that evening in celebration of someone’s birthday. Day five of the novena. By now I am starting to go a little more crazy and just not understanding completely what is really taking place. At some point during the day, I walk into the aspirant community room and stop dead in my tracks, dropping my keys on the floor. There sitting on one of the computer desks were some roses and some petals from them laying on the desk. I just stood there semi shocked and semi not sure what was going on. Halfway through at this point, I could really expect nothing. Day six of the novena. So the day is as normal and what not. I went into Italian as usual with the sigh of here we go again, I really need another way to help me study here and I hope she does not ask me any hard things. 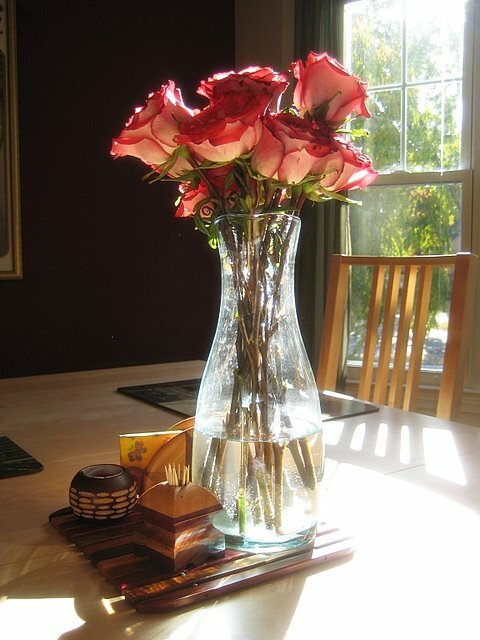 Partway through the class I notice on the table near the door, there was a vase with two roses in it. I lean toward Megan and pointed them out. We could not help but laugh. There also were roses all over this YouTube video I watch, not to mention the ones for Sr. Kim’s birthday. Mentioning all these incidences of the past days so far to Sr. Colleen, she asked me why I as saying the novena. To my response she called me a good and reminded me of where I was found in the bathroom…the source of my vocation. Day seven of the novena. In the morning, I found out that God and Saint Therese have a wonderfully beautiful sense of humor. My assistance in the morning is down in the locker room where the high schoolers are. When everyone is kicked out to class, I go around locking the bathroom that is just outside the area, as well as turning lights off and locking the doors of the locker room. When I went into the bathroom to turn the lights off and lock it, I found something. There sitting on the floor so nicely in the middle of the bathroom was a single rose petal. At that point, I really knew I was going crazy. How in the world could this be was the question in my mind. Day eight of the novena. Not that I was already feeling like I was going crazy at this point, this day topped it off for sure. It was our quarterly day retreat that was combined with the SDBs (our brothers of the Salesian Family). I thought for sure there would have to be a chance of a rose here. It was not that I was looking for one purposely, but rather that when you have received them thus far seven out of seven days, some part of you can not help but anticipate what is coming (yes, I know…participate don’t anticipate). The first thing is that someone pointed out to me that there was a brother who was reading her book. Sure, maybe it can count, but it is something that I had for the day. The second thing came from when we were at mass. Bear with me here. I was looking at the huge Crucifix that hangs about altar. From what I could tell, it was marble. On the left side, the “cloth” wrapped around Jesus hangs out to the side. There is a bigger piece kind of going downward and then a smaller one kind of straight-out/up a little. That little part I kept seeing as a white rose. I knew it was not as I have seen this chapel before and know it is just the “cloth.” The thing is, I could not get out of my mind that it is a rose. I was think many things, “am I crazy and just seeing what I think could be true,” “is this just what I want myself to see,” and “is this exactly what Saint Therese wants me to see.” During consecration, I cried a tear or two when the host was held up, as well as when the cup was held up. That is so unusual for me. I ended the day not know what to think. Day nine of novena. This the last day, I was not sure what would happen after the prior day. When I got up in the morning I knew I had to say the novena right away so that I could go through the day at ease. I prayed that I just needed one more concrete sign, one more thing, that could really show me that this is now where God wants me. I said that I know all these roses have been brought to my attention, but just one more will show me that I am supposed to be here, just one more. This was my prayer because I am not sure how to comprehend what had happened the past days. The day went on by and nothing. On Sundays we have adoration in the community. After the Exposition song, I moved over from where I was (as I was leading) into the main pews. The first thing I saw was the one red rose in the new bouquet that was place in front of the altar below Jesus. After prayers, I went and stood in front of the altar staring at that one rose. There were others around, but all pink and ones that have been there. Here it was, one red rose. In that evening prayer of adoration that I just mentioned, I had picked a song that I love to use for exposition. While this song has always meant something for me and I have always got something out of listening to it, the song hit me in such a different way. This was, also, before I even noticed the rose. Take a listen and you may understand why I am so drawn to it and that it hit me is such a strong way. So, this the days of my novena. Being that it is now past the last day of the novena, I have had some time to reflect on what has happen. For now, I will let you mull this over. Keep an eye out for a post about what has come to follow. This has been something hard for me to comprehend and to explain. The words I gave you here can not possibly justify what I feel inside with all of this. Be inspired. Remember that you are loved and God is watching over you always, ready to protect you. Peace. So, in light of a couple of conversations along with the inner thoughts of my mind and heart, a few things popped up that I would like to ask. Some people don’t genuflect at all. I think some sign of bowing or kneeling down is important as a sign of respect, but I am wondering people’s thoughts on when and how often. There really is no right or wrong, I am just looking for some thoughts. One way I see it is that people show a sign of reverence when coming into the chapel/church and then again before they leave that place of worship where Jesus is. The other way I see is that every time anyone moves from place to place or when they cross the tabernacle or anything of the like, they show that sign of reverence. What are people’s thoughts on either or both, or another of which they notice? This too has come up in conversation. Most people kneel on the kneelers that exist in churches. Some people do not use them. I know that again, neither of them is particularly right or wrong. I believe that whatever is done is what the believer feels is their way to connect through prayer to God. I could ask a couple of things here in this topic. Initially, what are your thoughts on this? As well, is it right to say to another that they must not kneel right on the ground if a kneeler is provided; this to show good example to others, to not distract them, and that we have to if one is provided, to use it? If I am correct in saying this, and I may not be, were not the kneelers created so that we might be more comfortable in praying? So if it is but only a comfort, should not one be allowed to kneel as they choose, even in community with people who have their lifestyle and charism? Please share any and all thoughts on these topics, answering those questions which I posed, or that of other related topics. Thank you!